Have You Heard of the Steiner Cabins? Built entirely by hand, with no power tools, from materials provided right on the spot by Mother Nature, the 100 or so distinctive log cabins built by the Steiner family are a Northwest treasure. It’s a fascinating story for anyone who loves history, architecture, and a pioneer spirit. 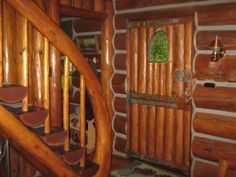 Henry Steiner, master carpenter who came to Oregon from Germany as a child, settled first near Oregon City, where he met his wife Mollie and began the work that would define his life: building log cabins from indigenous materials. Later Henry and Mollie and their brood (eventually, 13 children) relocated to Brightwood, a tiny community on the flanks of Mt. Hood, today known as one of the “villages of Mt Hood,” along with Welches, Zigzag, and Rhododendron. During the Depression years, Henry was part of the WPA team of local craftspeople who earned 90 cents an hour building the magnificent Timberline Lodge on Mt. Hood, today a National Historic Landmark that still thrills visitors with its incredible handiwork. Henry was just getting started. 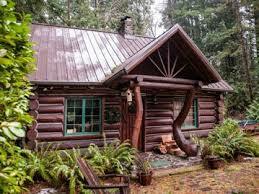 With the help of his wife and older children, he began building the small log cabins that today bear his name. All the building materials came directly from the site – logs from Doug fir trees, roofing shakes from cedar trees, stones for the fireplace and chimney from nearby streams—and the whole family worked. Mollie and the girls peeled the logs, helped build the windows; Papa and the boys felled the trees, split the shakes, and sledgehammered boulders into flat fireplace stones. On lunch breaks, Papa Steiner usually wandered through the nearby woods, coll ecting oddly shaped tree branches or pieces of tree trunks that he thought he might use in some fashion in some cabin someday – and so he did. Today those whimsical touches add to the visitor’s delight.